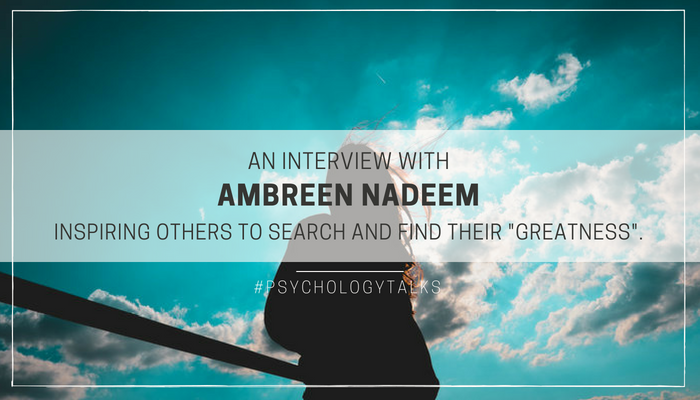 Ambreen Nadeem keeps Inspiring others to search and find their “greatness”. Pathways is taking time every month to interview women that Inspire others to search and find their “greatness“. Ambreen is one of those women. Ambreen goes by the name ‘psychology talks’ in her monthly column at Pathways. This mother of three hails from Pakistan but has been living in the Kingdom for the past eight years. The earlier part of her Saudi days was lived in Riyadh. She is a Jeddawi for the past two years. Armed with a Master’s degree in Psychology, certification in various languages like Spanish and French and a good practical understanding of human nature. As if that was not enough to credit her with, Ambreen has been conducting various mother and children workshops here in Jeddah. She is an ardent reader. Psychology, philosophy, astronomy, astrology and quantum physics are her main areas of interest. She enjoys arts, craft, painting and traveling around the world to explore various cultures and cuisines. Ambreen also practices Yoga and meditation on a daily basis. To serve humanity by spreading knowledge especially about human psychology, this can help people in their daily lives. Never give up, you may find one way closed but there is always an alternate route. My mother is always an inspiration in my life. She is always there when I need her, guided me at every step, and stood by me when I had to take the toughest decisions in my life. Most importantly she taught me the values of life. May Allah bless her always. What is there about a challenge you’re experiencing right now that you can be thankful for? I used to be a very career-oriented woman with high ambitions. But after kids, my thinking got changed. My family and my kids became my first priority. However, I still miss my full-fledged career. In order to stay in touch with my career, I do freelance work, but it is indeed very challenging. Several times I yearn to join professional life but when I look at my kids, I defer my decision.